At ubuyfurniture.com our kitchen rack and cart collection offers trendy solutions to make the most of your cooking and dining space. From casual and homey pieces to intricately carved and formal serving tables, it has something for everyone. Get rid of the clutter on your counter tops and add extra storage space by choosing a piece from this diverse selection of kitchen racks, and serving carts. 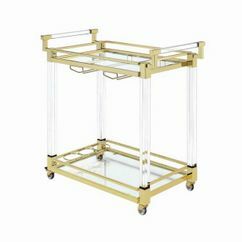 Whether you want to stow a microwave, hide away extra dishes, or spice up your dining evenings with a formal server, these kitchen carts are visually appealing and offer convenient storage to meet all of your needs. All Kitchen Racks, and Carts ship FREE to the continental U.S., usually within 3-4 business days!